This Sunday 14 October, Show Media will publish its latest issue of the Beau newspaper, themed around City style. It will be distributed with The Sunday Times to London and the southeast. 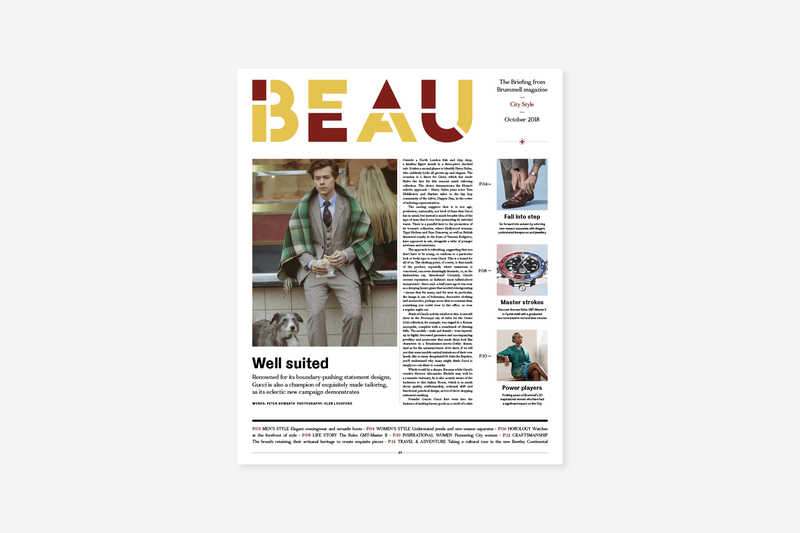 Beau is the sibling publication of Brummell magazine, the little black book for City professionals. Beau’s pages offer a taster of the best of Brummell‘s City intelligence, from style, watches and travel to motoring, food and drink. In this issue, we are proud to present a taster of Brummell‘s annual Inspirational Women listing – celebrating the innovative thought leaders pioneering change in the City. Elsewhere, we discover the mechanical prowess of the Rolex GMT-Master II, explore the current collections and collaborations in women’s and men’s style with an in-depth look at Gucci men’s tailoring, and champion the artisanal craftsmanship of some of Britain’s finest brands.